Update 2.3 is officially live for both iOS and Android! Once you’ve played you’re fair share of battles, tell us what you think. We’re here to listen and are curious about your feedback! My android won't download. Yay! In first second. Very happy customer. Edited by Ammo_Delivery, 11 November 2015 - 01:26 AM. I want the old loading circle back. And the old chat menu, the current one loads so much slower and is more confusing. and also where are the medals for rise of continenents? Stats page reformatting was unnecessary...you now have to scroll down in order to view average damage in a tank. I don't understand what benefit that reformat brought; it just seemed to make everything bigger for no reason at all. Aside from that, 100% neutral on the update. Nothing big was lost, nothing big was gained. Maybe Google Play is slow to update for Canadians? 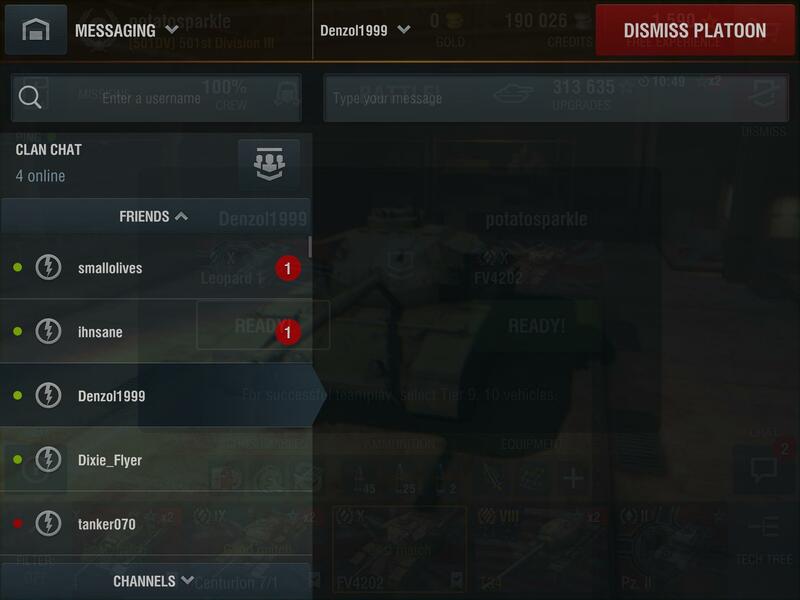 Why does chat now default to a full size blank page saying "clan chat" + " you're not in a clan "
Have to open up my friend list every time I want to say something or read something as an extra step? Do your developers even use the program?! How does that even pass as a valid idea or pass QA?! my game is not updating. on two devices. Been trying for over two hours! Feedback: Canal is a thing of beauty. We need more maps like this - large, complex, something for everyone, and some great sniping spots to boot. I notice when TOG II* dies we STILL don't get a smaller tank that rolls out of a cargo door to continue the battle in. The fact that this oversight has gone unaddressed for so long is outrageous. I suggest a quick patch before the next update. I think the tetrarch is perhaps the most reasonable candidate, but ideally issue a range of choices. No problems for me fortunately. I like the new icons and subtle changes. On three separate Apple devices I cannot download the update! Yes I deleted them all and attempted to reload. 3 devices doing the same thing means YOU GUYS HAVE SOME FAT BUGS TO FIX. Game Discussion → General Discussion → Rise of Continents Medals?